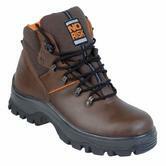 This safety boot from No-Risk is an perfect choice to protect your feet throughout your working day. The New Denver boot has the Clima Cork System which works with the shape of your foot. Hard wearing double density PU sole gives you superb grip whatever the weather. Made from a full grain leather that's tough and durable. Steel toe offers additional protection. No Risk New Denver S3 Dealer Safety Boot conforms to: EN ISO 20345:2011 CE S3 safety footwear standards. Reinforced steel toe cap for superior protection against impact. The Double density PU/TPU sole improves slip and abrasion resistance. A kevlar protection insert protects the user form heat, impacts and punctures. The Clima cork system improves the overall comfort of the shoe, moulding to suit the users foot. Supports a unique ankle balance system for improved user comfort and protection. No Risk Mackenzie S3 Black Safety Boot conforms to: EN ISO 20345:2011 CE S3 standards. Manufactured with a highly protective steel toe cap. The Double density PU/TPU sole is long lasting and also antistatic. The Double density PU/TPU sole is long lasting. 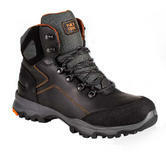 No Risk Discovery Black Leather Boot conforms to: EN ISO 20345:2011 CE S3 SRC safety footwear standards. 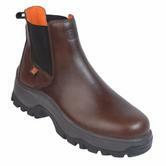 No Risk Saturne Brown Safety Boot conforms to EN ISO 20345:2011 - S3, SRC, CE safety standards. These boots have been lined with Sympatex making them waterproof. Manufactured with a steel protective insert, resistant to punctures and impact. The No Risk Armstrong boot is made in Portugal, using the best quality materials. The upper is crafted using full grain leather:This is water and abrasion resistant. It has a padded collar and tongue for comfort. Steel toe cap and midsole give you safety protection. The Patented Clima Cork Footbed system helps draw moisture away from the feet - keeping you feet warm and dry. The dual density PU sole unit is shock absorbing, antistatic and wears very well. The combination of the sole comfort and the Clima Cork insole make these super comfortable boots. The Armstrong is worn widely in industry applications and by local councils as the boots remain comfortable after many hours wear. No-Risk Hillary is a S3 Safety boot entirely metal-free that is essential for workers who need to go through metal detectors or work in environments where metal can become a hazard, plus the use of composite material gives the benefit of less weights therefore enhanced comfort. The boot is also waterproof and breathable thanks to the Sympatex technology. The Clima Cork System guarantees the maximum comfort for the wearer. 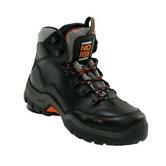 NoRisk Hillary Metal Free Waterproof Safety Boot conform to: EN ISO 20345:2011 S3 SRC safety standards. 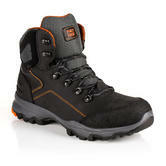 The No Risk Franklyn is a Black Waterproof, Breathable safety boot, with Sympatex lining. It has a Dual Density PU outsole - Hardwearing, yet comfortable under foot. Black, Smooth Full Grain, Premium, Waterproof Leather - Durable and flexible. Roomy Steel Toe Cap - Protects your toes from up to 200J impact. Steel Midsole - The midsole stops nails from puncturing the sole of your foot. Breathable, Waterproof Sympatex membrane - Water cannot get through- so your feet stay dry; air can pass through - so your feet dont sweat! Patented Clima Cork Footbed System - the No Risk patented Clima cork system moulds to your footprint. Its a great boot, with underlying comfort. 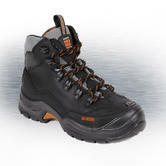 The Darwin S3 safety work boots include a durable double density PU outsole. The entire boot is made from non metallic components which makes it a lightweight work boot. Kevlar midsole for under foot protection. 200 joule composite toe cap gives high toe protection. Laser High Tech lining and the Airpump special insole. 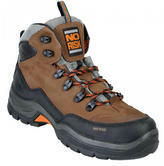 No Risk Darwin Safety Metal-Free Hiker Boot conforms to: EN ISO 20345:2011 CE S3. Reinforced Aluminium toe cap for superior lightweight protection against impact. Manufactured with a kevlar protective insert, resistant to heat, punctures and impact. 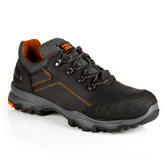 The No Risk King S3 SRC Safety Shoe is manufactured using onlytop quality materials . The upper is crafted using full grain leather which is water and abrasion resistant and has a padded collar and tongue for comfort. 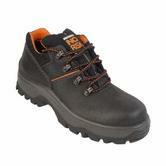 Steel toe cap and midsole provides everyday safety protection. The sole unit has antistatic properties. Clima cork system which helps draw moisture away from the feet keeping you feet warm and dry. Compliant with EN ISO 201345 S3 with an SRC - slip resistant sole. Provides exceptional protection with a steel toe cap. The Double density PU/TPU sole improves the products overall life. Tough brown nubuck leather material. Lined with breathable material, improving hygiene and comfort. Double density PU sole grants a comfortable wear. Protective steel toe cap & steel midsole. Ideal for any task in any condition. NO RISK was born in 1996, in Portugal. The No Risk mission is to design and make safety footwear for people who are faced with daily challenges: such as hazardous terrains, slippery surfaces, low temperatures and work-related injuries. No Risk creates safe, comfortable (very comfortable) and affordable footwear. 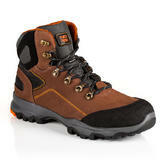 Safety boots for the most daring guys, without compromising on comfort and safety. No Risk’s reputation for comfort is built on the unique, patented cork footbed in each paid of No Risk boots: its easy to feel comfortable with a shock-absorbing, sweat-wicking, odour-eating, natural cork footbed underfoot. No Risk: its all about the comfort. Your foot is unique - no other foot has the same footprint. So why do other companies try to sell you insoles that don't conform to your footshape? The No Risk CLIMA CORK SYSTEM improves the climate of your feet inside your boots. This layer of cork between the insole and the outsole insulates your feet from the outside cold and heat. Cork is a self-moulding material: so when you wear our Clima cork footbeds you create a unique "footprint" for your feet. This gives you support underfoot where you need it. It reduces fatigue by supporting your whole foot. The Clima Cork footbed distributes weight and pressure evenly. And it absorbs impact at every step when your feet punch the ground. The comfort is supreme, which is why we make such a fuss about it! More safety Boots and Shoes you can find HERE, Or you might be interested in our Side Zip Safety Boots Category.